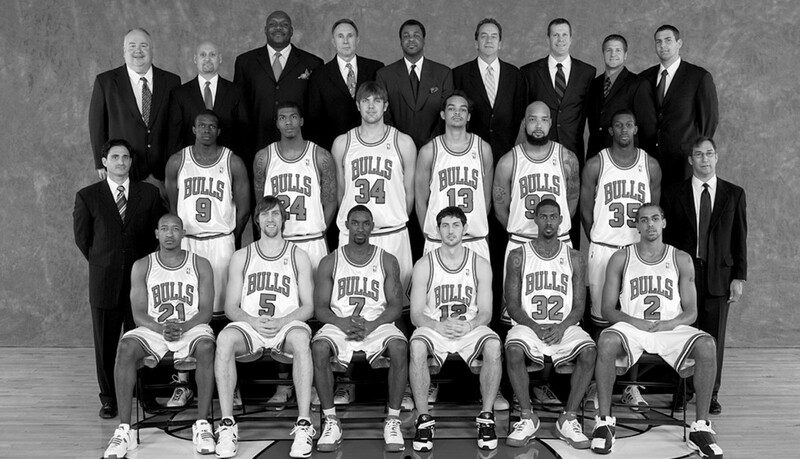 Left to Right: front row): Chris Duhon, Andrés Nocioni, Ben Gordon, Kirk Hinrich, Larry Hughes, Thabo Sefolosha. (middle row): Assistant Athletic Trainer Marc Boff, Luol Deng, Tyrus Thomas, Aaron Gray, Joakim Noah, Drew Gooden, Demitrius Nichols, Head Athletic Trainer Fred Tedeschi. (back row): Equipment Manager John Ligmanowski, Strength and Conditioning Coach Erik Helland, Assistant Coach Mike Brown, Assistant Coach Ron Adams, Assistant Coach Pete Myers, Head Coach Jim Boylan, Assistant Coach/Advance Scout Mike Wilhelm, Assistant Strength and Conditioning Coach Michael Irr, Video Coordinator Adam Tatalovich. Re-signed free agent Andrés Nocioni and signed free agent Joe Smith (07/18/07) ... exercised third-year options on Thabo Sefolosha and Tyrus Thomas (10/19/07) ... relieved Scott Skiles of head coaching duties (12/24/07) ... named Jim Boylan Interim Head Coach (12/27/07) ... named Michael Brown Assistant Coach (01/29/08) ... waived Viktor Khryapa (02/06/08) ... acquired Drew Gooden, Larry Hughes, Shannon Brown and Cedric Simmons from Cleveland in exchange for Ben Wallace, Joe Smith and Chicago’s 2009 regular second round draft pick; also traded Adrian Griffin to Seattle (02/21/08) ... the team’s 33-49 record qualified it for the NBA Lottery. First round, Joakim Noah (Florida); second round, Aaron Gray (Pittsburgh), JamesOn Curry (Oklahoma State). Chris Duhon participated in the All-Star festivities in New Orleans, as he teamed with former Bull B.J. Armstrong and Candice Dupree of the WNBA’s Chicago Sky in the Haier Shooting Stars Competition ... the Bulls ranked second in the NBA in attendance with an average of 21,988 fans per game and sold out all 41 regular season games, to extend the franchise’s sellout streak to 90 consecutive games.